Today is the day for all American patriots to fly the Stars & Stripes with pride! I love to see that banner blowing in the summer breeze. Yes, you can call me a flag-waving American! I love my country. 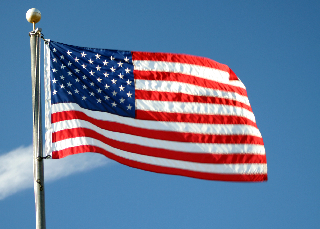 You can read more about Flag Day in this Wikipedia article. I also recommend that you take a listen to a fabulous song by former American Idol contestant Phil Stacey called Old Glory. This is a beautiful song that will make you proud to be a citizen of the US of A. You can grab the track from Amazon here.